Harvest season is slowly getting underway in Northern Illinois, but the growing season that has thrown so many things at area farmers had one more surprise. A disease that previously had not been found on the continental US was verified first in Indiana, and then confirmed in northern Illinois. Corn leaf samples from three northern Illinois counties have been confirmed positive for the fungus Phyllachora maydis by Megan Romby, National Plant Pathologist with the USDA Animal Plant Health Inspection Service in Beltsville, MD. Positive counties in Illinois are LaSalle, DeKalb and Bureau. In her Illinois Bulletin article Dr. Suzanne Bissonnette from the University of Illinois Plant Clinic shared that the samples were collected from commercial fields by Monsanto breeders and pathologists and sent to Dr. Kiersten Wise in response to her inquiry for samples and distribution information of the Tar spot pathogen. Dr. Wise and Purdue Plant Clinic director Gail Ruhl initially identified the pathogen which is new to the United States 1 ½ weeks ago and submitted confirmation samples to the USDA. Upon receipt of the Illinois samples, they diagnosed the fungus, contacted the University of Illinois Plant Clinic and submitted the Illinois samples to the USDA for confirmation at their request. 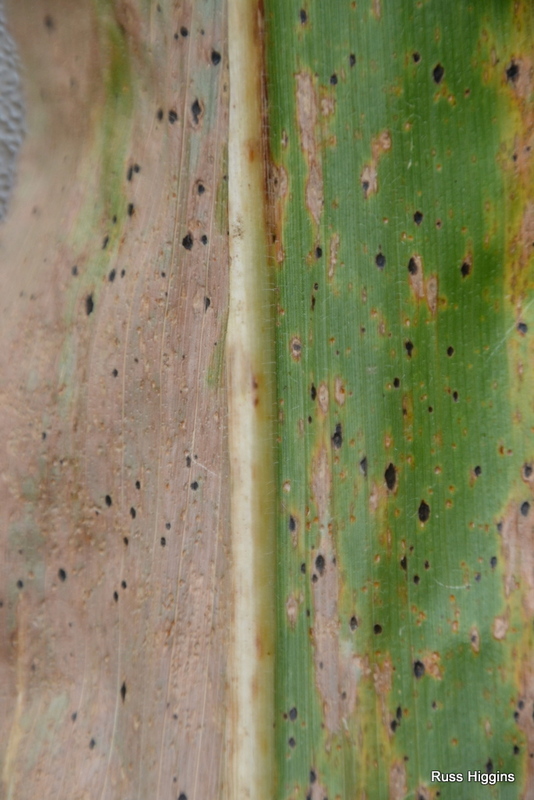 Scouting for the disease has been active in Illinois. Jennifer Chaky, Pioneer Plant Diagnostic Clinic, also has samples from Bureau County diagnosed with Tar spot as have I with samples collected in LaSalle County. Tar spot has distinctive symptoms. 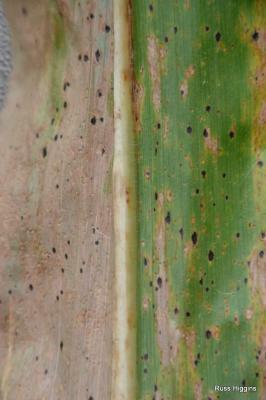 The fungal fruiting body, called an ascomata, really does look like a spot of tar on the leaf. Lesions are black, sunken oval to circular. They can be small flecks of about 1/64" up to about 5/64". The lesions can merge together to produce an affected area up to 3/8". If you run your finger across the leaf you will feel tiny bumps. To date only one of the pathogens, Phyllachora maydis, has been found in IN and IL. If you are scouting your fields prior to harvest and suspect Tar spot please submit a sample to the University of Illinois Plant Clinic. They are interested in getting a comprehensive idea of distribution of the disease in the state.